TOP Floor Penthouse w/ Panoramic Sunrise to Sunset Ocean Views, Just Steps to the Sand! This amazing penthouse, located in South Mission Beach, offers stunning views in a great location. This is the perfect place to host a family vacation or enjoy a quiet retreat with friends. This property has free high-speed WIFI, ocean-view balconies, fireplace, big screen smart-TV, cable, sauna, dishwasher, washer & dryer, two parking spaces, propane grill, elevator, and more amenities! Check the amenities section to see a complete list. Located at the southern tip of Mission Beach, this property is ideally situated for ocean front views without all the craziness of the boardwalk. The beach leads all the way to the front of the house, and it is only a few minutes' walk to the ocean. The bay is even closer – less than a 2 minute walk. There is easy access to parks, playgrounds, basketball courts, volleyball courts, and the boardwalk. Sea World is only a 5 minute drive away. This is a four bedroom single-story condo on the top floor of the building. There is elevator and stair access. The kitchen is fully stocked with all dishware, utensils, cookware, and appliances. There is also a washer and dryer in the home. Parking is a breeze with two reserved spots in the secure underground garage. Linens, bath towels, and beach towels are all included. All you need are your personal toiletries. The living room has a large flat screen TV and digital cable.There is a propane powered BBQ on the living room balcony. Three of the bedrooms have king beds. The fourth bedroom has two sets of bunk beds: one is a twin-over-twin, the other is a twin-over-full. There are also 2 queen-sized plush air mattresses available as well as a twin-sized cot. The condo sleeps 12 comfortably. Interested in other Mission Beach vacation rentals with oceanfront views? We manage several units of different sizes and decor in the same building. 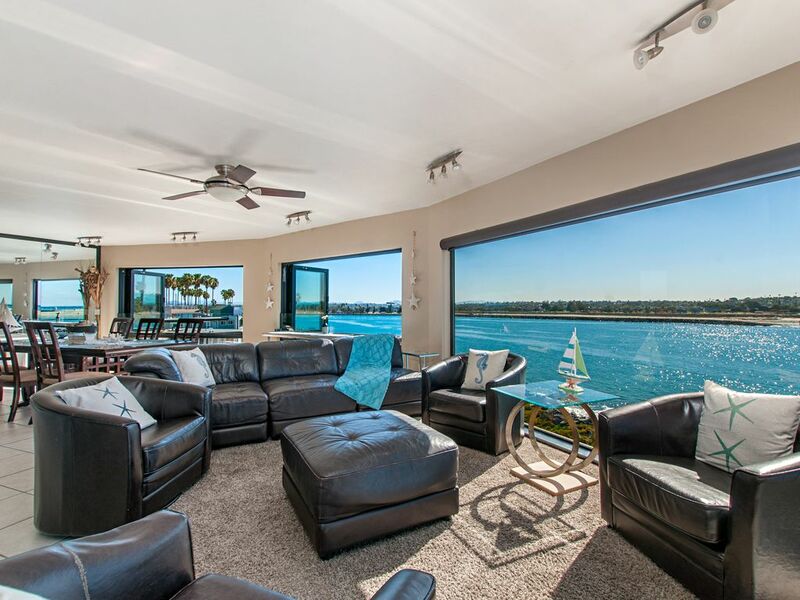 Welcome to beautiful San Diego, we are Dana Horne Vacation Rentals! We hope to help you with all your vacation rental needs! Please contact us with any questions you may have. A little about us - Dana came to San Diego from the New England area over 30 years ago and immediately knew San Diego was where he wanted to establish himself. He earned his Real Estate License in 1979, his Broker's License in 1984 and founded Dana Horne Realty in 1987. In the year 2000, he purchased his first vacation rental property and a new aspect of his business was born . . . Vacation rental management! Becky, Dana's wife is our "Vacation Rental Manager". Together, along with the help of Jenelle, "Rental Agent" plus our small, but experienced staff, we pride ourselves on strong customer service and making ourselves available to our clients before, during, and after office hours, seven days a week. Let us help you make your stay in San Diego GREAT! Myself and 8 other family members just returned from a 4 night stay. We did enjoy our time even though it rained almost every day. The house however was not what I was expecting. The pictures and description of the house are a bit deceiving. The location and view is great but in honesty this is not a luxury penthouse. It’s very old and is in need of a remodel. Floors are miss matched in every room and super dirty. (So bad that all of our socks were black) kitchen wasn’t the cleanest either and had a really weird layout. Their was a stackable washer and dryer right next to the refrigerator which made it almost impossible to use the freezer because the door would only open about a quarter of the way. Also we were never able to get the BBQ working. All the furniture is very old and bedrooms are in need of new mattresses the bathrooms are very old. In fact the sink in the bathroom didn’t drain. It took a few hours for water to go down after teeth brushing and hand washing. The owners were having the living room window worked on when we arrived. (They did email me letting me know that it was being worked on but assured me that they would be done around the time of our arrival) they were still there when we arrived and told me they needed to come back the next day from 11-noon to do a water leak test and remove the scaffolding. I was ok with it because the scaffolding was a an eye sore of the building and obstructed our view. They came back but still didn’t remove the scaffolding. The window guy left and never mentioned a thing about being back a 3rd time but then showed up at 7:30am the next day without a warning and woke us up. I own a few vacation rentals myself and understand that repairs do need to happen but I just felt showing up at 7:30am without a warning was unprofessional. To sum it up the vacation was still very much enjoyable but I won’t be renting this penthouse again. We are very sorry that your experience was not what you expected, and that we failed to meet our usual high standards for your stay. We understand and share your disappointment, particularly with the vendor failing to properly inform you or us of his non-scheduled return to the property. As you can see from other reviews, most of the problems you experienced are not at all common and if given the opportunity, we would have been more than happy to send the cleaners and handyman to remedy the issues you were experiencing. We have attempted to contact you privately several times, but we have had no response. As for not being a luxury penthouse, we never describe it as such despite its beautiful views; we choose to welcome many families with children into this home, and while we keep our furniture clean and in good condition, we love for our guests and their children to relax and be comfortable rather than nervous about damaging overly-expensive furniture and decor. After receiving your feedback, we took a close look at the photos on VRBO and do not understand what you saw that you consider deceiving. We feel that the pictures are very accurate. We are glad to hear, that despite the rain, you were able to enjoy your stay! My family, consisting of 8 adults, spent a week in this condo for our annual Christmas vacation. The views are really exceptional. I want to give this property a 4.5 star rating, but since that is not possible I had to go with 4 stars, primarily due to fact that it could use refreshing in the bedrooms. The living room, dining room, kitchen and one bath have been updated and are nice. However the bathroom fixtures in the other bathrooms and bedroom furnishings are not 5 star. Having said that we would stay here again in a heart beat if we were in the San Diego area. The layout of the condo works very well. There was plenty of space for all of us to gather in the living room. Pros: Location- This is a great location. You simply turn right from the condo and walk a short distance and you reach the beach boardwalk. If you turn left you can walk to a nice park. View- We watched dolphins and seals. It was also interesting to watch the boats leave each morning. My sister in law loved watching the dogs play on the beach across the water. More on the Location- Close to everything!!! Yet located in a nice quiet neighborhood. Kitchen- Well equipped with everything you need. Basic supplies- trash bags, some spices, cleaning supplies, etc. are also provided which was very nice. Accessible: Two of our family members have limited mobility and the elevator was perfect for them to get from the garage to the condo. Bedrooms- Two of the bedrooms have balconies that over look the water. While there is only one bedroom with an en suite bathroom, the bedroom in the back of the condo (no water view) has a door that closes the bedroom and a bathroom off from the rest of the condo. This bedroom also stays darker/cooler than the other bedrooms which was perfect for my husband who likes to sleep in. Parking garage- This property has a covered and secure parking garage. Parking Garage-This is only a slight con- the two parking spaces are smallish. We had one mid sized SUV and a van. To park both of them you had to be very careful as there was very little space between the doors. Some reviewers have commented on the airport noise. We did not find the plane noise to be an issue. If you are sensitive to noise bring ear plugs. Also we did not see any signs regarding rentals and the people we encountered on/around the property were very nice. We had an amazing time. Our family consisted of 7 adults, 1 teen ,2 children, and 2 medium size dogs. There was more than plenty of room for all. Penthouse had EVERYTHING we needed for cooking and the beach, lots of towels, and beds were very comfortable. We did rent surfboards, boogie boards, SUP's and wetsuits at local rent shop. I will tell you that during our 7 days and nights we only cooked 2 dinners and 3 breakfasts. SO many eateries in the area it was hard not to partake. Highly recommend Guava Beach for a casual fun dining area (up the beach a ways) and Saska's for fine dining, (also up the beach and pricey but delish). One night we did a bonfire at the beach and it was so fun. The views from this place are unbelievable. A newer "thing" in the area are the Limes and Birds! Motorized scooters that you rent with an app. SO fun and really made it easy to get around even for this 57 year old grandma!! Our men golfed at Torrey Pines and it is a must do for any avid golfers, but secure tee times way ahead of time as we did.. Belmont Park was so quaint and fun for all. Two good size parking spots in underground garage, fit 2 SUVS, MDX and Rogue. Overnight parking available for extra cars just down the road from house at beach which is viewable from house. Plus rental staff was so accomodating and available. Yes, planes start taking off from San Diego airport around 6:30 AM but GET UP! YOU DON'T WANT TO SLEEP ITS SD!! Our party is very active, surfing, boogie boarding, walking, taking runs along boardwalk, sightseeing (OLD TOWN, CORONADO, SAN DIEGO ZOO, SEAPORT VILLAGE, MARITIME MUSEUM, etc) we did it all plus played games at night and enjoyed our cocktails. First rate all around. Don't hesitate this place is awesome. The Condo was very clean and had more amenities than we expected. Loved the view. There was seven of us. We had more than enough space and we were very comfortable. Wish we could have stayed longer. This was a lovely place with the most fantastic views from each room. It work out perfect for the entire family and our two golden retrievers. The location was great. Close to everything but also very private. I would stay here again. I really appreciated the fact we were able to have our dogs with us. Thank you. Daily, Weekly, and Monthly rentals available. Rates vary according to season and length of stay.